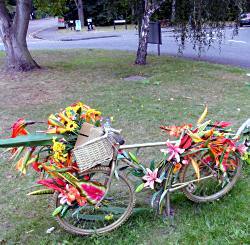 Legacy was a keyword for the Olympics, and Weybridge has celebrated its inclusion in the Cycling Road Race route by putting up some entertainingly decorated bikes at various points, apparently as legacy sculptures. 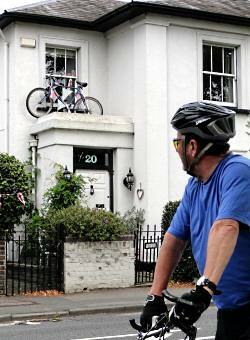 Here are some at one roundabout we passed (pictures) while I was leading a leisure ride earlier this week. We stopped for a group photo, pretending to ride the bikes. I nearly got flattened by a lorry mounting the roundabout as I took the snap. I don’t want to address the question of my own personal legacy in detail just yet, thank you. 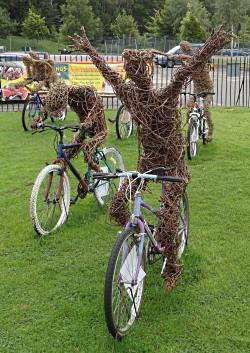 Decorated bikes are even at Brooklands, the historic motor racing circuit and museum, just up the road (picture). 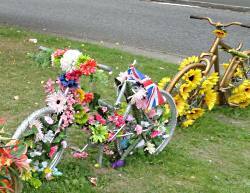 And some locals have even done their own bike installations in tribute to the cycling racers (picture). Or perhaps it’s the only way they can beat the bike-shed thieves. It's not about lycra. It's not about racing, or saving the world, or crossing the Nullarbor Plain alone except for the film crew. It's about the best way of commuting, shopping, sightseeing, socialising, partying, and generally just getting from A to B every day: by bike. We're based in York, but get around the UK a fair bit. Read my Real Cycling column every month in Cycling Plus magazine.